the ground was super mushie at the barn this morning, so i ended up not actually riding... but Aramis was pretty happy because he got walked and got to eat loads of grass :D heading out again tomorrow, should be able to ride then. i hope the weather is as beautiful tomorrow as it was today! pure acetone... the fact that the acetone isn't cut by any other product makes it super strong, and able to easily dissolve nail polish. i use the Beauty Secrets brand from Sally Beauty Supply. 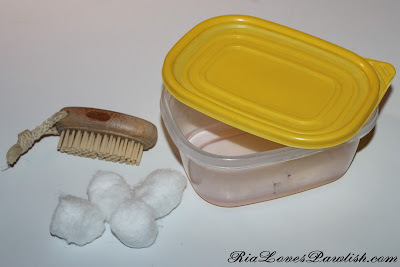 you also need a nail brush, cotton balls, and small tub big enough to put your fingers in... i re-use a tub deli meat came in! pour enough acetone in the tub that you are able to fully submerge all your nails, i do both hands at the same time! for regular polishes, less than 30 seconds should enable you to be able to just wipe it away with a cotton ball dampened with acetone. for glitter polishes, you will need to submerge them a bit longer, closer to two minutes... but again, you will be able to just wipe the polish off with an acetone dampened cotton ball! this way beats scrubbing away at your nail for what seems like eternity trying to get off glitter. once it's all off, i scrub my nails and the ends of my fingers really well with a nail brush to get off all the acetone. my very favorite nail brush is the EcoTools Bamboo Nail Brush. sometimes i use soap, especially after removing glitter to make sure i get off all the acetone and any sneaky remaining glitter bits! the key after using this method is to moisturize! right now i'm using Sally Hansen Nails & Cuticles Hand Creme. you have to replace the moisture in your skin and nails, because acetone will strip most of it out. the Sally Hansen cream will sink in quite quickly, so you can apply polish pretty soon after using the cream! just make sure to wipe off the actual nail to make sure there isn't any grease sitting on top.